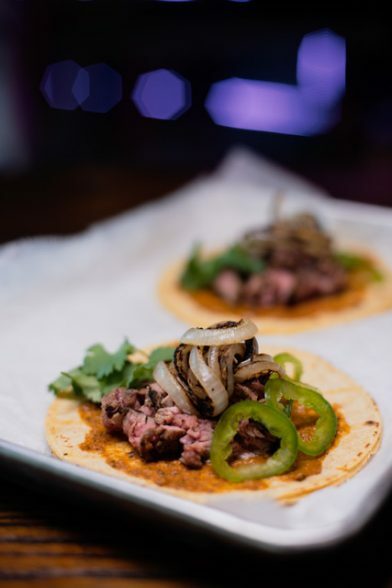 Nola Cantina brings modern spin on tacos to Frenchmen St. Earlier this week, Nola Cantina opened its doors on the corner of Frenchmen Street and Esplanade Avenue in New Orleans, bringing with it a modern take on tacos and more. Ambassador Operations founders Robert and Chloe Watters are behind the restaurant and also operate a handful of other bars and nightclubs throughout the city. Together with Chef Octavio Ycaza (of Miti Miti pop-up fame), the Watters’ latest venture is in the former home of Rare Form. “We are proud to be a part of the neighborhood and excited to bring a different kind of experience to Frenchmen St.,” says Chloe Watters. Featuring a large patio, interior lounge, open kitchen and full service throughout the venue, Nola Cantina is equal parts indoor and outdoor, with two large bars, plenty of craft cocktails, sangria, wine and local beers. As far as food goes, diners can select from offerings such as single tacos, ceviche and contemporary spins on traditional Mexicano food. Vegetarians are welcome, and the kitchen is free of wheat flour. Eventually, Sunday brunch will be incorporated into the operations, and there are plans for Burlesque Brunch every first Sunday.